In what will probably be the first and last article for pursuing naturally aspirated power gains in our 1992 NSX, we look into the design of the stock NSX’s Variable-Volume intake manifold, gut and port it, and add headers. We then strap the car to a dyno to see how much power we gained over the factory rated 270hp @ 7,100rpm and 210lb-ft of torque @ 5,300rpm 90-degree 2,977cc V6 engine. Designed in the late 80’s and debuting in 1990, the Honda NSX was undoubtedly a game changer; not only for being the first real user friendly and reliable supercar, but for being ahead of its time in both style and technology that’s still relevant today. The NSX’s 3.0L 90-degree V6 revs to an astonishing 8,000rpm redline with an 8,300rpm fuel cutoff, which is on par with the iconic S54 and S65 engines that BMW introduced 10 and 17 years later with inherently better balanced inline-6 and V8 engine configurations. The NSX featured two engine variants over the course of its 15 year production run. The NA1 designates the 2,977cc 270hp C30A which featured 90mm pistons and a 78mm stroke, while the NA2 utilized the 290hp C32B. Introduced in 1997, the C32B displaced 3,179cc from a larger 93mm piston and a thinner fiber-reinforced metal (FRM) cylinder liner while retaining the same 78mm stroke. The larger displacement increased the NSX’s torque output from 210ft-lbs to 225ft-lbs. Other than a few small changes including slightly larger valves and most prominently, the switch from a cast log manifold to tubular headers, the C30A and C32B are almost identical motors. Weighing in at 3,010lbs, the NSX was focused on weight reduction. It was the first production car to feature an all-aluminum monocoque body, suspension, and an extruded aluminum alloy frame which reportedly saved nearly 500lbs over an equivalent steel chassis. 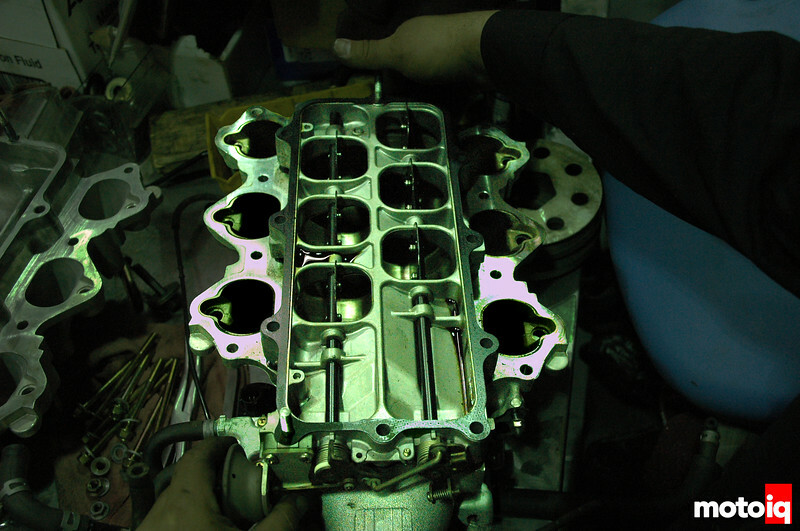 The NSX’s 3.0L C30A also features an all aluminum block with cast-in-steel cylinder liners, a fully forged steel crankshaft, and low-pressure cast aluminum cylinder heads. Exotic materials were used throughout the car and the NSX was the first production car to use titanium alloy connecting rods which were common in Formula One at the time, and thus the NSX’s rod weighs 190 grams less than equivalent steel rod. The NSX also featured magnesium valve covers and lower manifold plenum which we will see later. The throttle body (just out of the picture on the right side of manifold above) feeds this relatively small plenum which is divided in two at the entry and feeds each bank’s three cylinders. The manifold is up-side-down in this photo and the runners with visible fuel injector ports bolt down onto the heads. Honda and the NSX are probably most well known for their breakthrough Variable Valve Timing and Lift Electronic Control, or “VTEC” system. While VTEC isn’t new to most of our readers and probably needs no explanation, it utilizes dual cam profiles which allow for low RPM torque, fuel efficiency, and streetability and then when the more aggressive cam profile is activated by oil pressure allows for high RPM power and breathability. The VVIS plate consists of six butterflies which are closed by vacuum and open between 4,600 to 4,900rpm and held open until redline. The secondary lower plenum bolts to this plate and once the butterflies are closed, the plenum is completely sealed off from the throttle body and the intake runners. 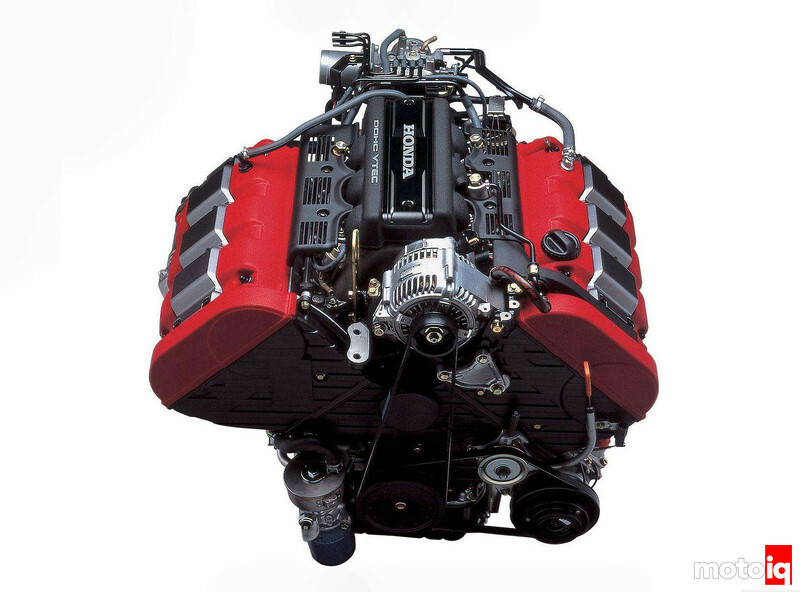 In addition to VTEC, the NSX’s C30A uses a Variable Volume Induction System, or VVIS. 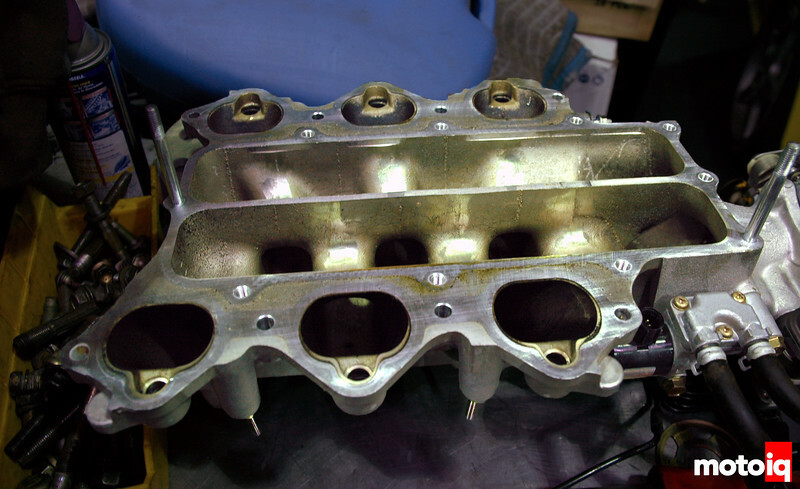 The VVIS intake manifold uses a separate air intake plenum located beneath the main intake manifold. This lower plenum is completely sealed off and separated from the primary manifold by six butterfly valves, which are actuated by vacuum and open between 4,600 and 4,900 rpm. 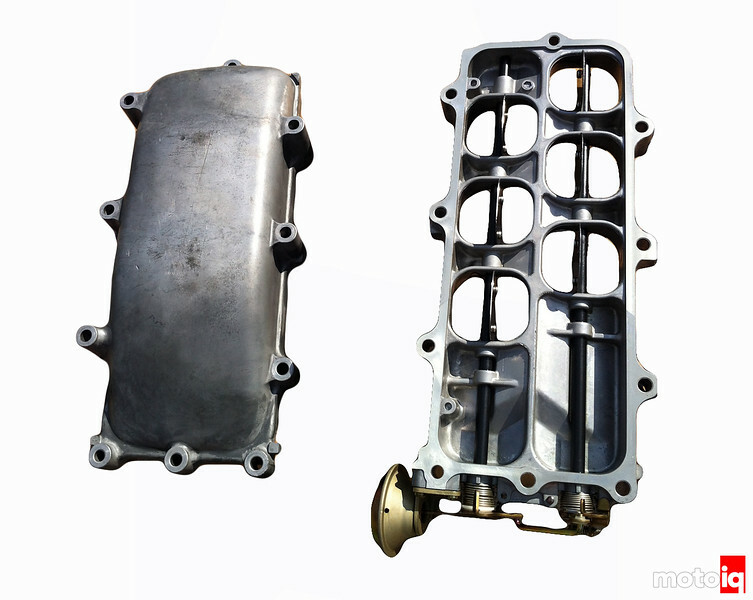 The lower intake plenum (left) is made entirely from magnesium and bolts on to the VVIS plate (right). When the butterflies open, the added volume of the secondary plenum creates a higher resonance frequency, which in turn creates a sonic pressure wave. This sonic pressure wave hits each pair of intake valves just as they open, promoting more rapid and complete cylinder filling. This system was designed to work in concert with VTEC to improve low-end torque when the butterflies are closed. However, this additional plenum is not fed by the throttle body and the only way for air to enter or exit this plenum is when the 6 butterflies are open.